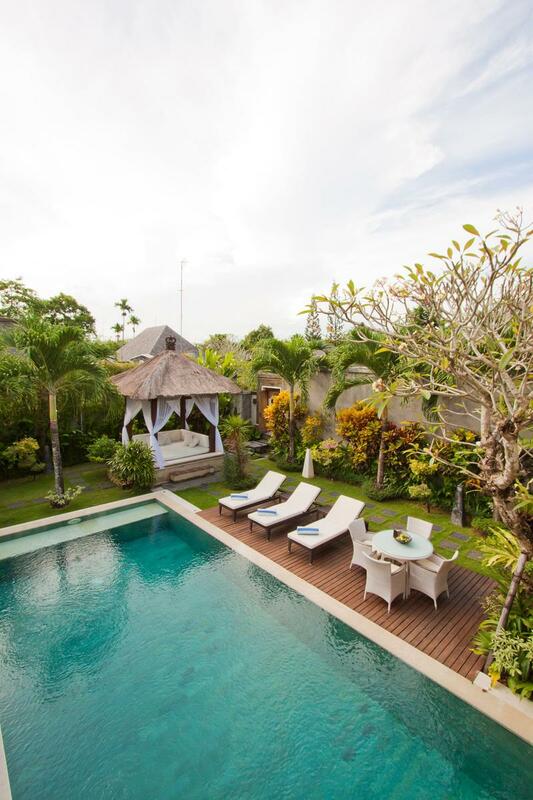 Villa 3419 is a tastefully appointed three-bedroom retreat located within the tranquil confines of the semi-rural village of Umalas. 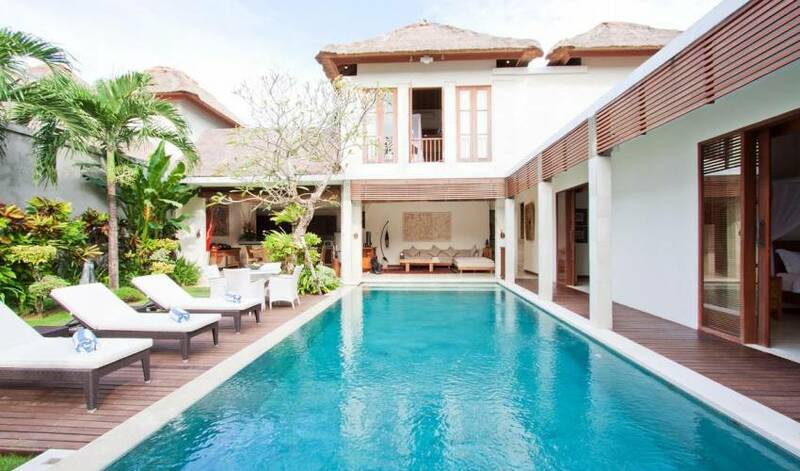 It is an area blessed with rice terraces and natural scenery where the pace of daily life is somewhat more laid-back to the nearby Seminyak. 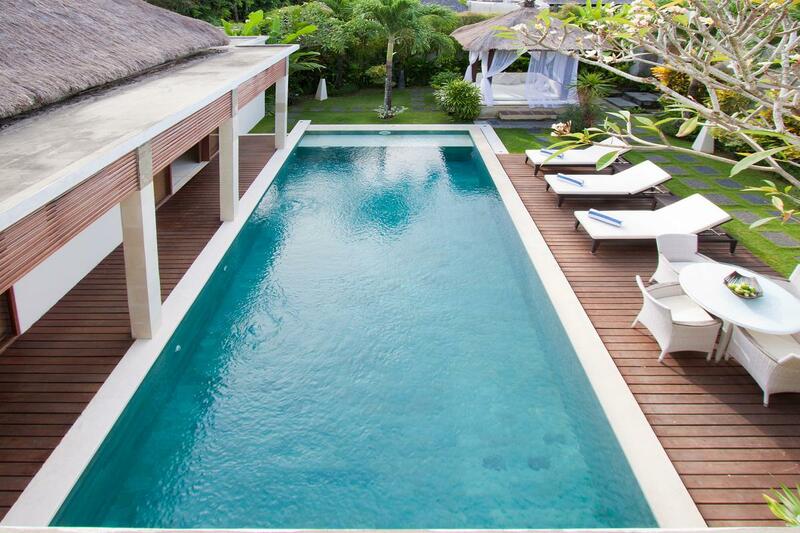 Villa 3419 is part of a family owned complex with around the clock security and ample parking for private vehicles. 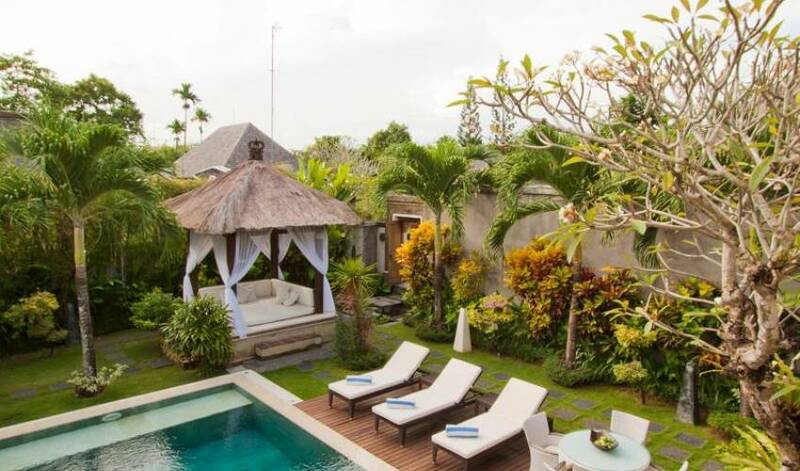 The villa is nestled within its own compound and is accessed via an elaborately carved Balinese gate. A series of stepping stones that cross a small lotus pond reveal a generous sized garden filled with native plants and other species of tropical greenery. â€¨â€¨There is a full length swimming pool edged by a timber deck with reclining sun-loungers as well as an outdoor table setting for alfresco dining under the stars. 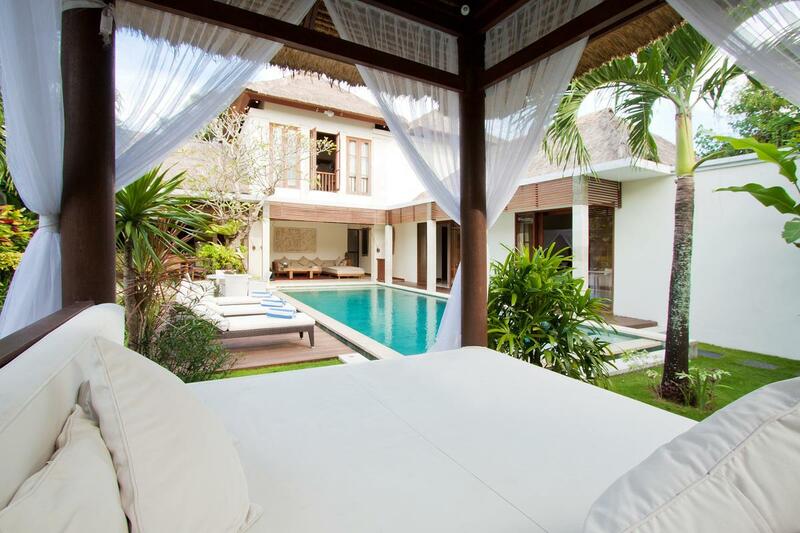 However, the focal point of the garden is a traditionally thatched lounging pavilion complete with soft cushions and crisp white curtains that blow in the breeze. It is the perfect niche to escape the heat of the day and curl up with a good book or take pleasure in an afternoon nap. 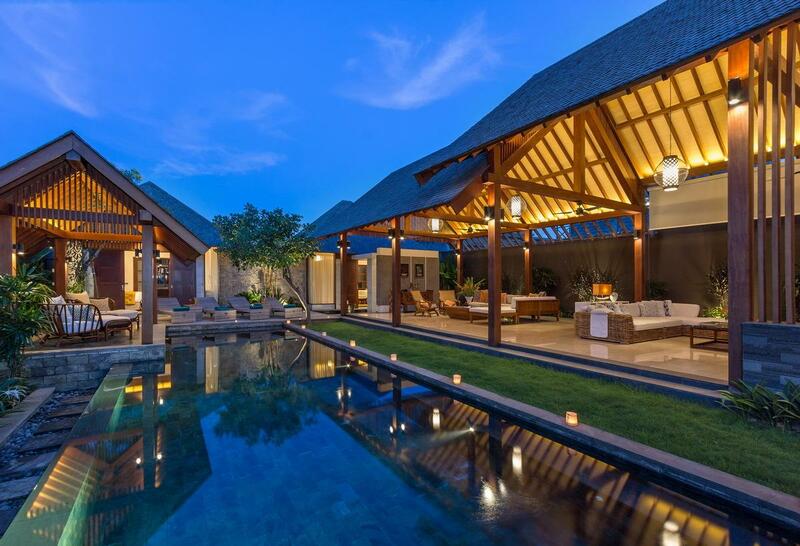 Structurally Villa 3419 is a modern L-shaped building that has been inspired by elements of classic Balinese design such as a traditionally thatched roof top. The open-style dining area, with its elevated ceiling, features a rustic table fashioned out of a single length of timber that has been created for long evenings of social interaction. 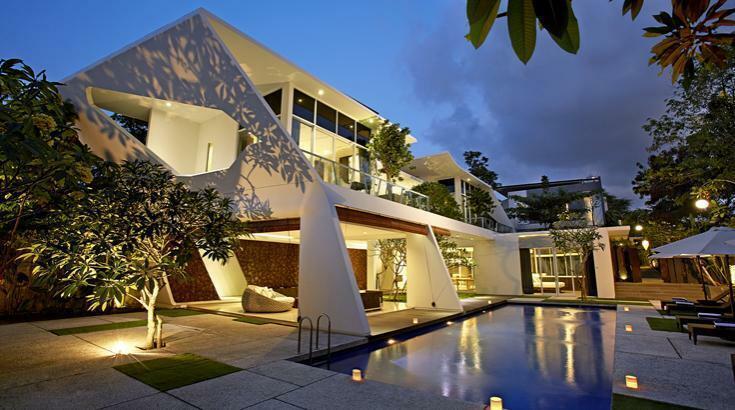 This is complemented by a contemporary kitchen with high-end appliances and all necessary items of tableware. 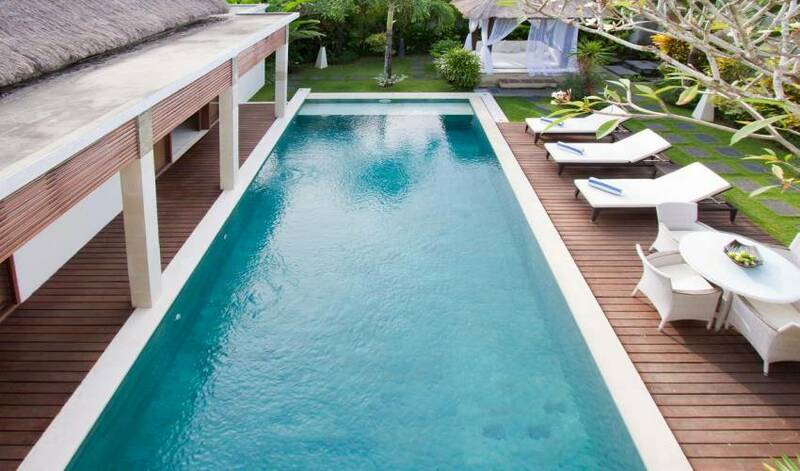 â€¨â€¨The integrated living environment is open to the elements and is orientated towards the pool. It is dominated by an oversized modular sofa that can seat up to six adults in absolute comfort. There is also a large screen plasma television with satellite channels and home entertainment system for relaxed viewing. 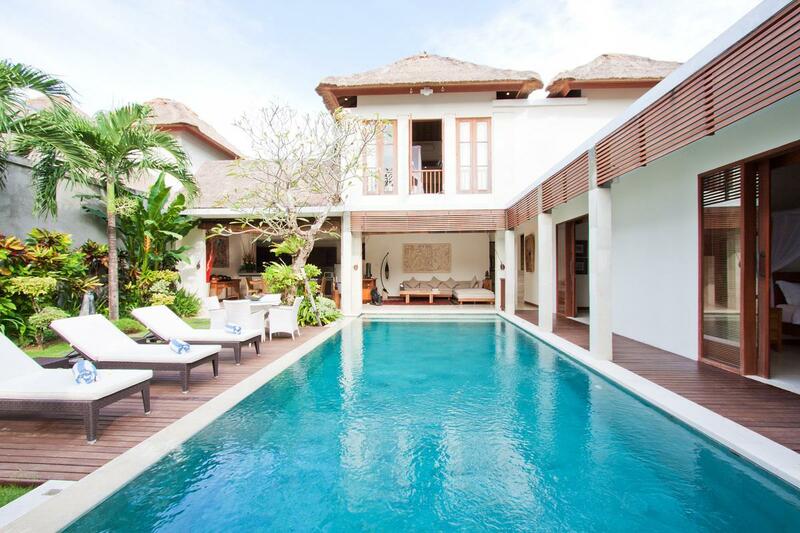 Villa 3419 houses an eclectic collection of artistry that extends to rustic artefacts, black and white photos of yesteryear Bali and other eye-catching pieces. 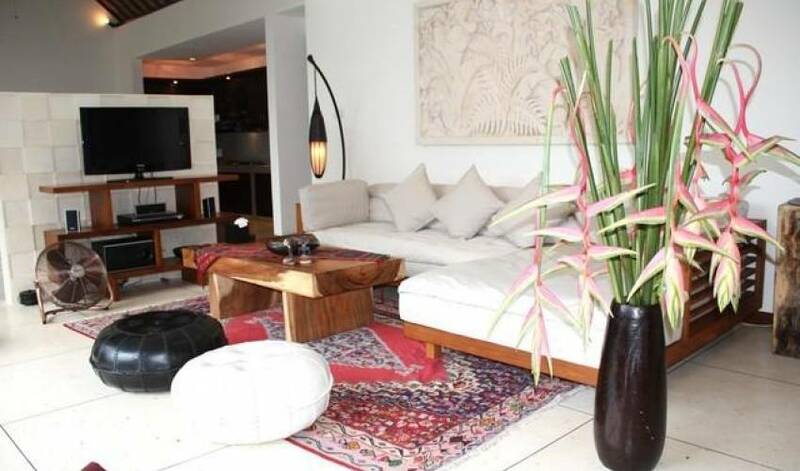 There are also vibrantly coloured paintings, warm textiles and trendy home wares that are combined to create a look that can be described as tropical chic. Quarters Downstairs overlooking the pool is a pair of bedroom suites; both feature a canopied double bed and a restful sitting area for moments of quiet contemplation. There is ample space for the storage of personal belongings in each room leading directly into a luxury en-suite bathroom. A deep terrazzo bathtub big enough for two and semi-outdoor shower ensures spa styled bathing indulgence. â€¨â€¨Another bedroom suite is secluded upstairs for guests seeking some extra privacy. 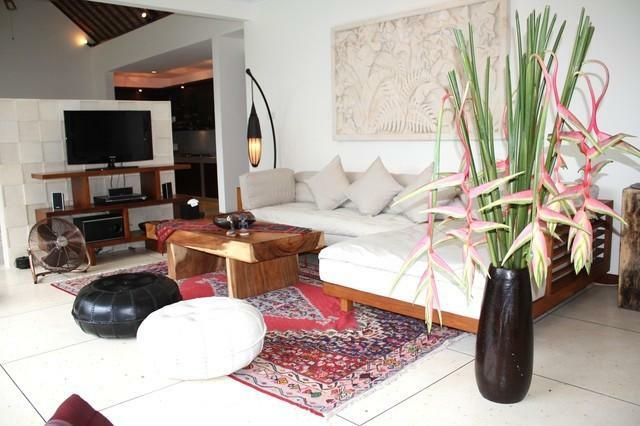 It has its own little foyer decorated with a carved chair and a series of Balinese prints adorning the walls. Glass panelled doors open wide to reveal an adult sanctuary that is bathed in natural sunlight. 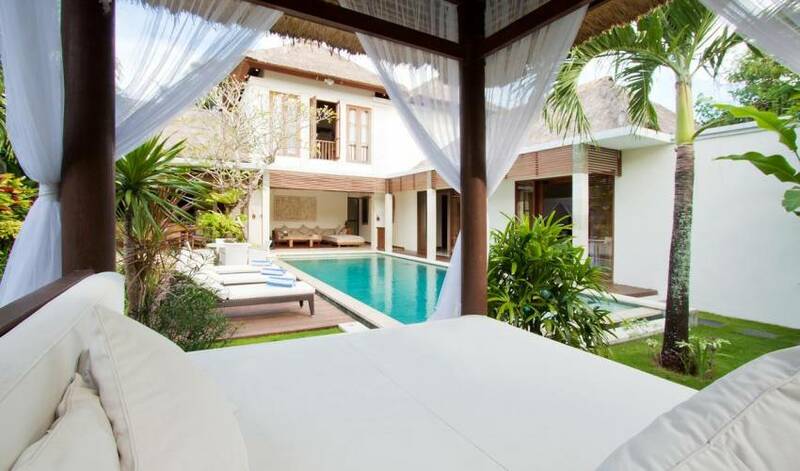 The huge canopied bed is fitted with pristine linen and promises nights of undisturbed slumber. While the creamy stone en-suite bathroom with its terrazzo bathtub lends itself to relaxing bathing rituals at the end of each day spent exploring the island. 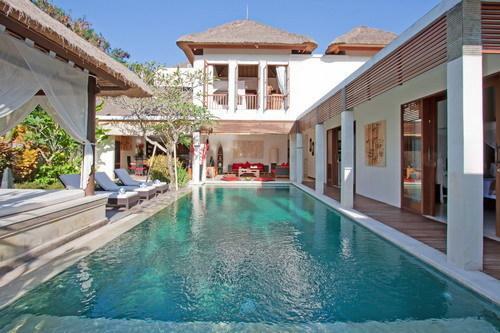 Villa 3419 is all smart living in tropical Bali. 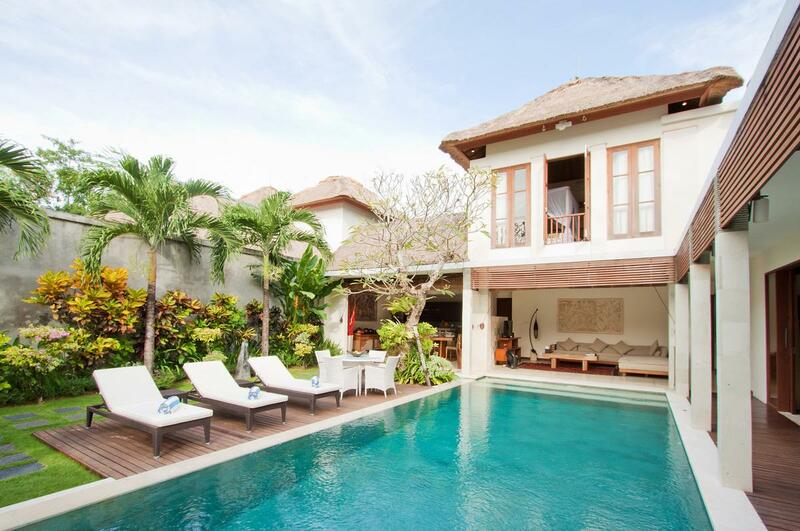 The villa accommodates up to six adult guests in complete comfort without compromising privacy. It is fully staffed by a professional team and a personal Chef is available if required. Culinary services at Villa 3419 extend to grocery shopping and meal preparations with a comprehensive choice of local and international dishes to choose from. 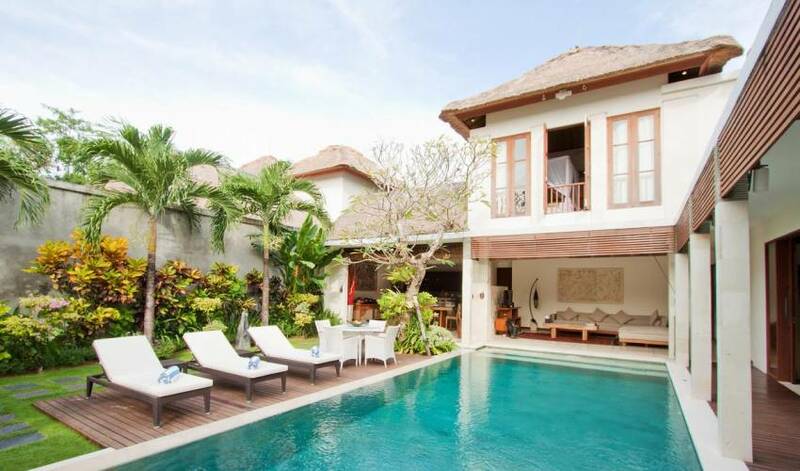 Villa 3419 can also be rented in conjunction with the adjacent Villa 3420, Villa 3421 and Villa 3418 for extended family gatherings or group events. 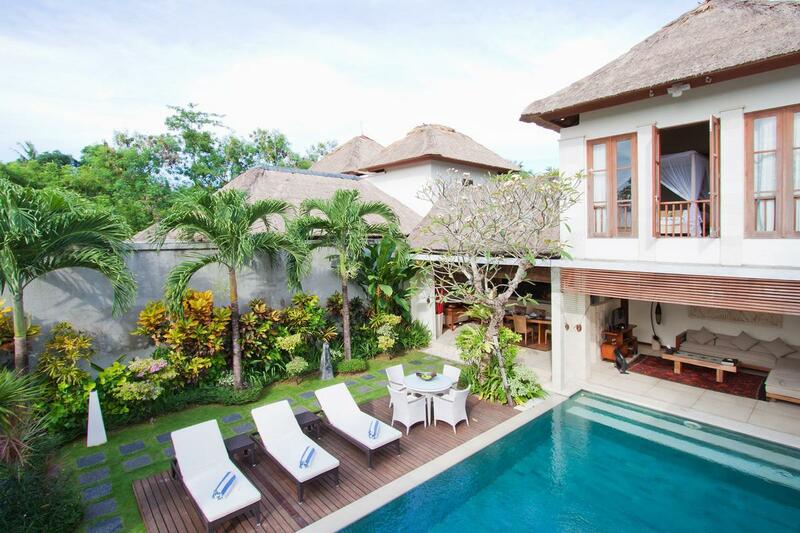 Combined there is a total of 11 bedrooms available to accommodate up to 22 adult guests. The complex is the ideal location to host a special celebration such as an intimate wedding, special birthday or anniversary with friends and loved ones.